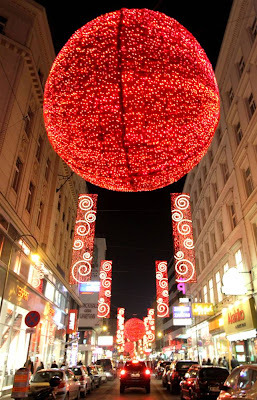 Christmas decorations glow in the old town of Vienna, Austria. 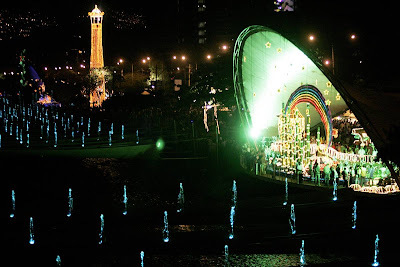 The city was lit up on Nov. 27, in anticipation of the holidays. 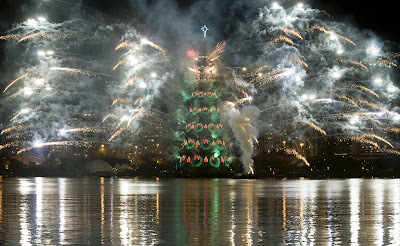 Fireworks illuminate the world's biggest floating Christmas tree on Dec. 5, in the opening ceremony at Rodrigo de Freitas Lagoon in Rio de Janeiro, Brazil. 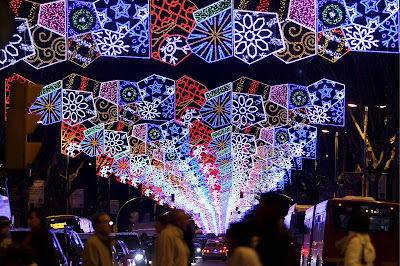 Christmas lights illuminate the Diagonal Avenue in Barcelona, Spain. A Christmas tree with lights and fireworks are displayed during the holiday season at the Reforma Avenue in Mexico City, on Dec. 5. 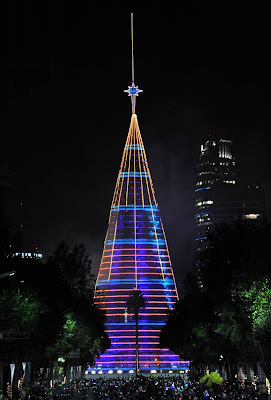 The artificial Christmas tree measures 367 feet at its highest point. 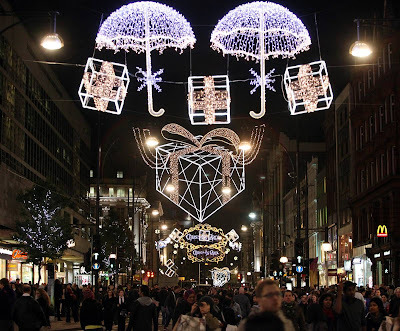 Pedestrians make their way underneath the Christmas lights on Oxford Street shortly after their official switching on on Nov. 3, in London, England. The two main retail streets in London's West End of Oxford Street and Regent Street had a joint switching on ceremony by actors Jim Carrey and Colin Firth. People gather around the Children's Museum which is decorated with Christmas lights in San Jose, Calif., on Dec. 1. 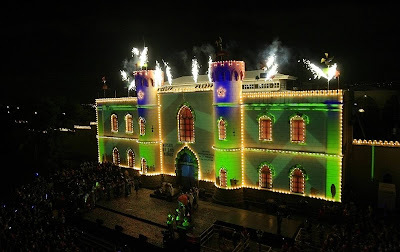 More than 500 lights illuminate the museum during the Christmas season. 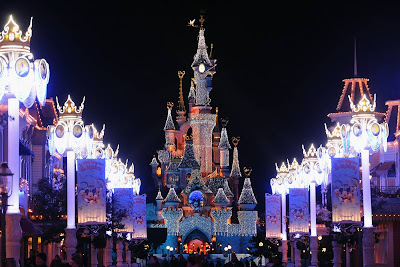 The Sleeping Beauty Castle is illuminated during the Disneyland Magic Christmas Season Launch at Disneyland Resort in Paris on Nov.
People walk past Christmas lights in the town of Varna, east of the Bulgarian capital Sofia, on Dec. 7. 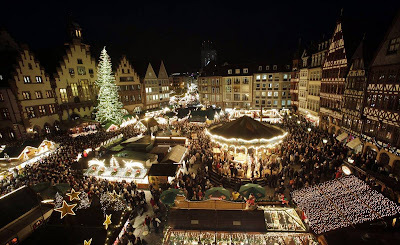 The Christmas market in Frankfurt, Germany, opened on Nov. 25. The traditional market takes place through Dec. 22. 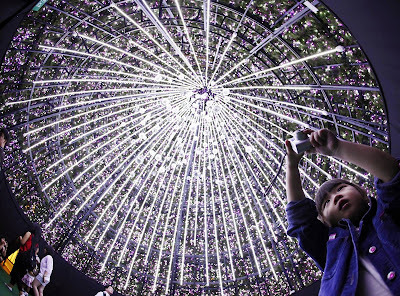 Children take pictures of the interior of a 6-story Christmas tree outside of a shopping mall in Singapore, on Nov. 26. 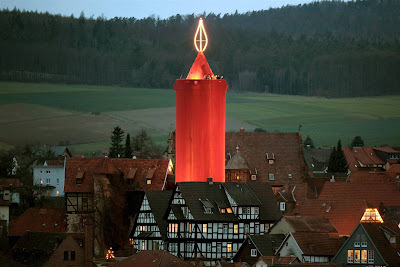 A steeple is covered with red cloth to form the world's largest candle at the Christmas market in Schlitz, Germany. The candle is made of a stone tower which measures 36 meters in height and is covered with more than 1,000 square meters of cloth. Approximately 140 light bulbs are adjusted to the steepletop in the form of a flame. 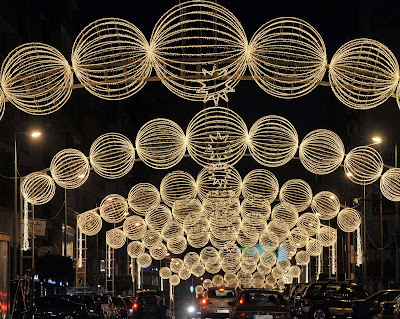 Christmas decorations adorn a street in the New Jdeideh neighborhood of Beirut, Lebanon, on Nov. 29. 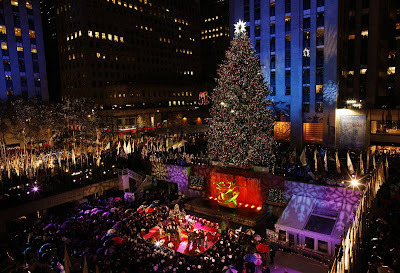 The 77th annual Rockefeller Center Christmas Tree was lit up in New York on Dec. 2. 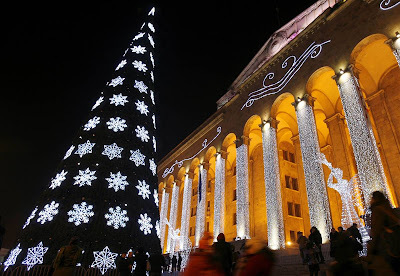 The parliament building is decorated with a Christmas tree and decorations in Tbilisi, Georgia, on Dec. 6. 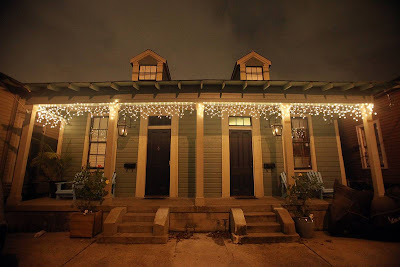 A New Orleans home is decorated with Christmas lights in the Upper Ninth Ward. People across the country are getting into the holiday spirit as Christmas approaches. Christmas illuminations are lit along Champs Elysees Avenue on Nov. 23, in Paris. 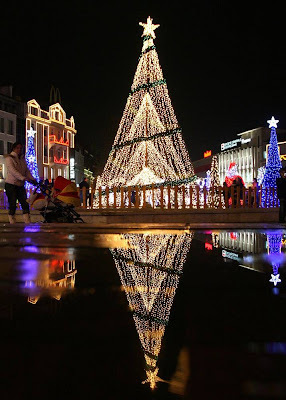 People walk near the Medelin River on the first day Christmas decorations are lit up in Medelin, Spain, on Dec. 5. 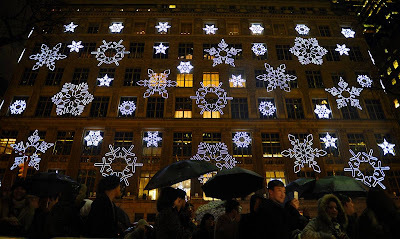 Onlookers pass by Saks Fifth Ave. before the 77th annual Rockefeller Center Christmas tree lighting ceremony in New York. 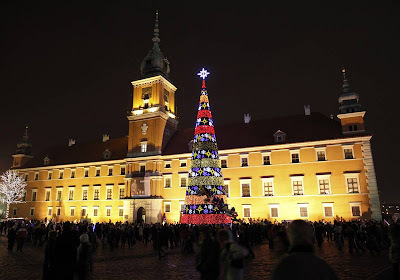 People attend the annual Christmas lighting ceremony in front of the Royal Castle in Warsaw, Poland, on Dec. 5. 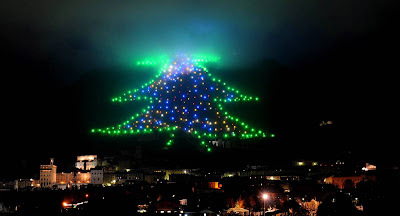 A Christmas tree shaped lighting decorates the slopes of Mount Ingino in Gubbio, in the Perugia district in Italy on Dec. 7. The tree, measuring 650 meters long, will remain on Mount Ingino until Jan. 10. 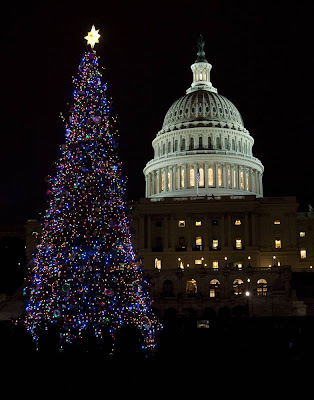 The U.S. Capitol and the Capitol Christmas tree are seen on Dec. 8 in Washington, D.C., during the tree lighting.